If you love the opening scenes of the late 1980s television show "Full House" or the 2016 sequel "Fuller House" and want to see their locations in San Francisco, you aren't alone. Those places are popular destinations for thirty-somethings who grew up watching the original, and a new generation who love the reboot. Before you go looking for it, you need to know that the "Full House" house wasn't quite what it appeared to be. In fact, to create those iconic opening credits — which looked like it all happened in the same place — filmmakers used two different spots. The Tanner family's home had a fictitious address: 1882 Gerard. Don't try to find that on your mapping app because it doesn't exist. Searching a map for "full house house" won't help much either. Here's where you need to go to see the San Francisco locations that went into making those oh-so-short opening scenes. If you're a casual fan, the family picnic scene location is also one of San Francisco's iconic photo locations with those adorable, candy-colored Victorian houses and the city skyline behind them. Hard-core fans may also want to see the red door, but that takes more work (which is detailed below). 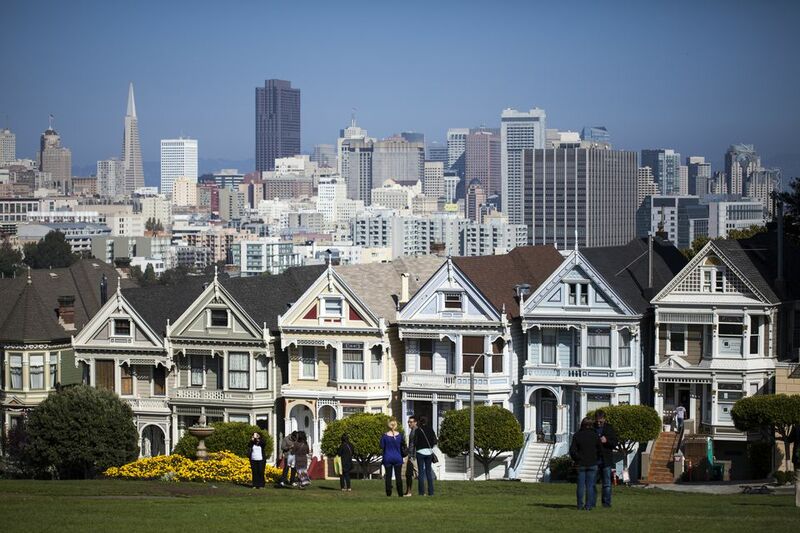 The family picnic in the opening credits of "Full House" was filmed about two miles east of downtown San Francisco near the Fillmore and Hayes Valley Districts at Alamo Square Park. The Victorian-style houses (which are often called the Painted Ladies) in that scene are between 710 and 722 Steiner Street. Climb the hill to get the view with the San Francisco city skyline behind them. You can get to Alamo Square by city bus from Union Square. You can drive to them, but you might end up in a temper tantrum when you can't find a parking place. And don't even think about double-parking. Ridesharing services can get you there, too. You can use the destination of Alamo Square Park to set up your ride. Where Is the House With the Red Door? If you remember the family's house with the red door well enough, you'll know that the entrance is on the right side of the house. Only one of the Painted Ladies has a door on the right. You might think that's all you need to know, but it's not. In fact, the red door that the family went through was somewhere else altogether, a mile away from Alamo Square. The house the Tanner family goes into at the end of the picnic scene is far away, north of Geary Blvd on the west side of town in the Lower Pacific Heights neighborhood. When you get there, you'll find that a lot of things have changed. Its address isn't 1882 Gerard, either. It's 1709 Broderick. It was used only for exterior shots, but it doesn't look the same. The house's pale gray exterior has been repainted. And the door isn't red. If you want to take a good-looking photo of the non-red door of this "Full House" house, it faces east. To get the front nicely lighted, try to get there at mid-morning, just after the sun peeks over the top of the buildings across the street. Otherwise, your coveted photo will be a mess of gray-blue shadows. The house's address is all over the internet. That doesn't mean you should become one of those annoying people who a pest of themselves when you go to see it. Don't make yourself comfortable on the front steps without asking the owner's permission first, no matter how much you loved the "Full House" show. Before you even think about doing that, imagine how you would feel if total strangers walked up and started taking pictures of themselves on your front porch. The house with the door is more than a mile away from Alamo Square. That's a 5-minute drive, but when you get there, you would need extreme good fortune to find a legal parking place. And this is not the place to double-park, block a driveway or otherwise behave like a jerk. Not only would your mother tell you to stop being rude if she saw you, but you are likely to get an expensive parking ticket or even worse, return to find that your car has been towed. From Alamo Square, it will take you about 25 minutes to walk to the house on Broderick or to get there on public transit. Your best option may be to call a rideshare service. Here's a little trivia bonus: If you look closely at the top roof line of the house and compare it the one next door, you'll see a feature of many San Francisco Victorians. It has a false front, created to make the house look bigger than it is. After all that, you still didn't find that red door, did you? To make finding all of the "Full House" house addresses even more complicated, the red door was removed and sold to a neighbor. Its new address is unknown, and it might not even be red by now. In 2016, show creator Jeff Franklin purchased the 3,125-square-foot, iconic house for $4.1 million, saying he couldn't resist according to the Hollywood Reporter. Opening credits of the Netflix-produced sequel "Fuller House" start with a drive across the Golden Gate Bridge. After that, they show a family picnic at Alamo Square but no views of the Painted Ladies. At the end, they go through a red door into the house at 1709 Broderick.